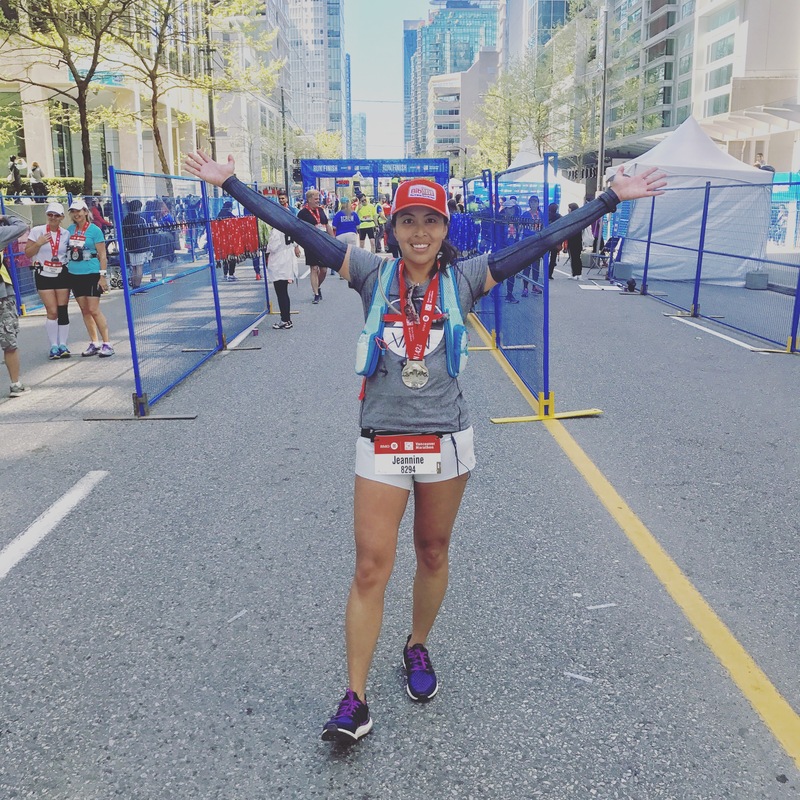 The first few months of 2017 flew by really quickly and before I knew it, my first big challenge was upon me: the BMO Vancouver Marathon… My first local marathon. 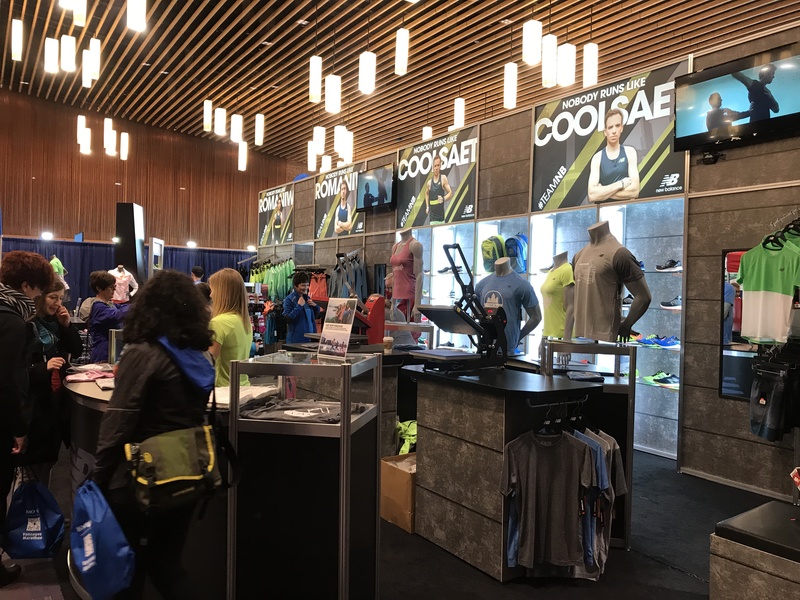 I was looking forward to the BMO Vancouver Marathon Expo because it’s always a huge event. I went on the first day, in the evening, and there were no lineups. Picking up my race bib was very easy and they included a gear bag as well. To get your t-shirt and transit pass, you have to wind your way through the maze of vendors. Thank goodness, the vendors were all good. 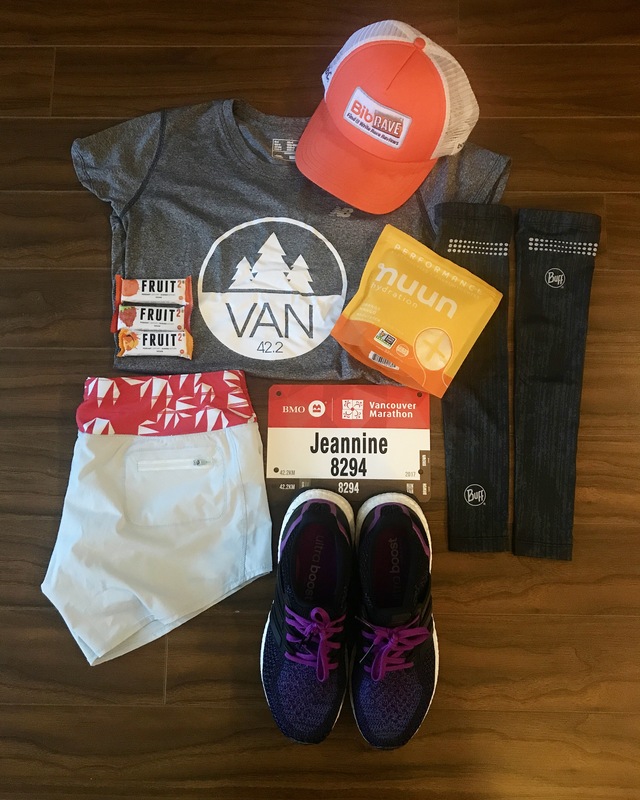 My haul from the expo included some Epsomgel, Nuun Performance, Xact Nutrition Fruit2 bars, and a New Balance shirt with custom decal Van 42.2 decal. I also got a chance to try on the new On CloudFlash, which they claim is their fastest shoe. It’s super light and I wish I got to try it outside. They felt comfortable for a racing shoe. I finally arrived at the t-shirt station. The design matched this year’s medals, but I’m not a huge fan of the colour. I’ll still wear it though, it’s a nice souvenir of my first local marathon. I also love that they give every runner a free one-time use transit pass and free shuttles to the start line. The start line isn’t the most accessible but these gestures sure help a lot. 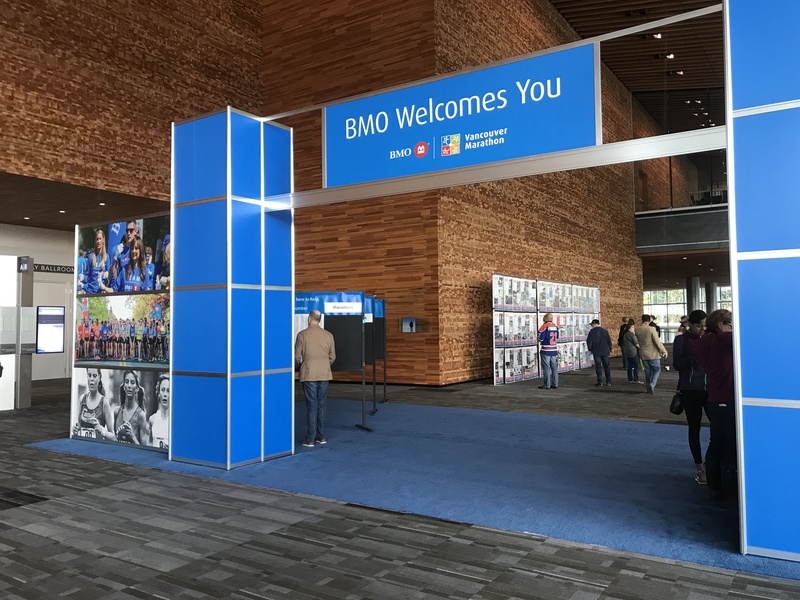 I did scope out the first big chunk of the BMO Vancouver Marathon course prior to the race, which you can read about here. Let me just say now that it’s a hilly course. The first 30 km has a good chunk of uphill but you will also be rewarded with long stretches of downhill. 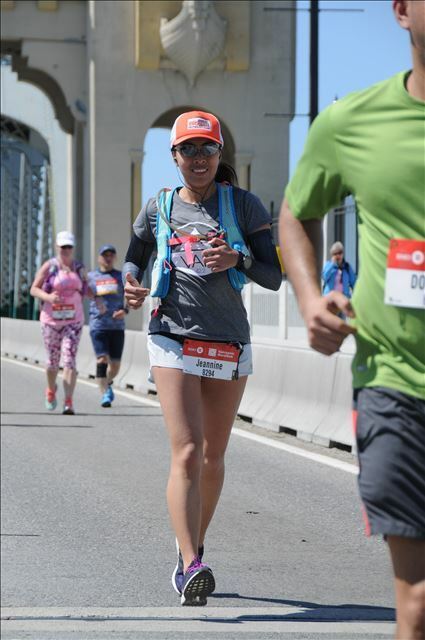 After crossing the Burrard Bridge (the 30k mark), it’s mostly flat as you run around the park until about 1 km away from the finish line where you will be greeted by an unfortunately placed incline. The last 500 meters are the hardest because you’re so close but it’s taking you a lot longer to get there. 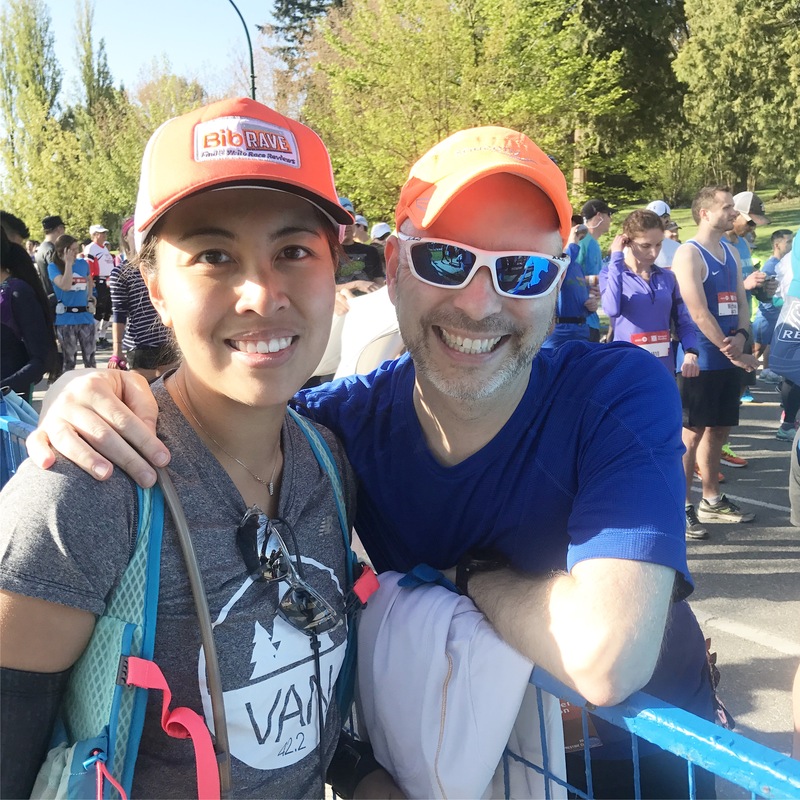 The BMO Vancouver Marathon course takes you on a tour of Vancouver’s prettiest neighbourhoods including Kerrisdale, Dunbar, UBC, Point Grey, Kitsilano, the West End and they save the best for last, Stanley Park. There will be lots of tree-lined streets to see, long stretches of beach, upscale neighbourhoods and the seawall brings you gorgeous views of the ocean, the North shore, and the Stanley Park landmarks. Aid stations were plentiful, but my only complaint is that there is only 1 station with bananas. I think all aid stations in the last quarter of the race need solid food. I was looking for it and I missed the only aid station with food. Port-a-potties were at every aid station so that wasn’t a problem. There were tons at the starting area too. 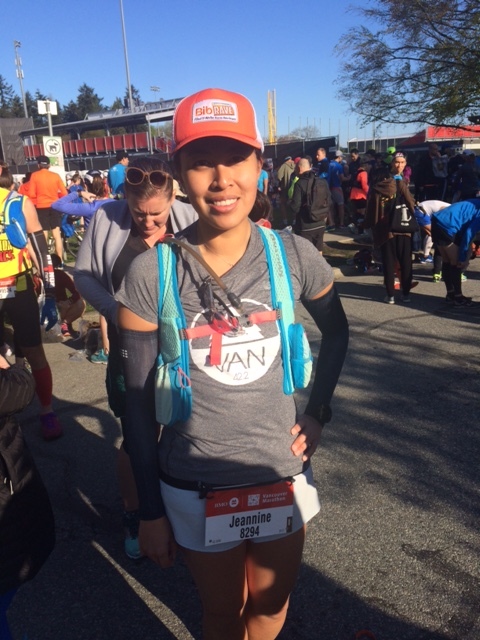 I started the BMO Vancouver Marathon on a good note… I got to sleep in! Marathoners start at 8:30 as opposed to the half marathoners who start at 7 AM. Cuski and I arrived at Queen Elizabeth Park around 8 AM. We took the Canada Line to Oakridge Station and walked to Midlothian Avenue. It was a perfect, sunny day. I was pumped. I found fellow BibRave Pro, Bradley (Bradley on the Run), at the corrals. It was so great to see him and wish him well. He ran a great race, which you can read about here. I felt great. I knew the course, had enough sleep, and had a fuelling plan. What could go wrong? When I hit the dreaded Camosun hill, I managed to get over it and then some. I felt great and was on track for a sub-5 finish. Unfortunately, I hit my wall at the halfway mark. It became hotter and this stretch from the beaches to Kitsilano was such a mood killer. Also that NW Marine Drive hill, which nobody really talks about, took a beating on me. 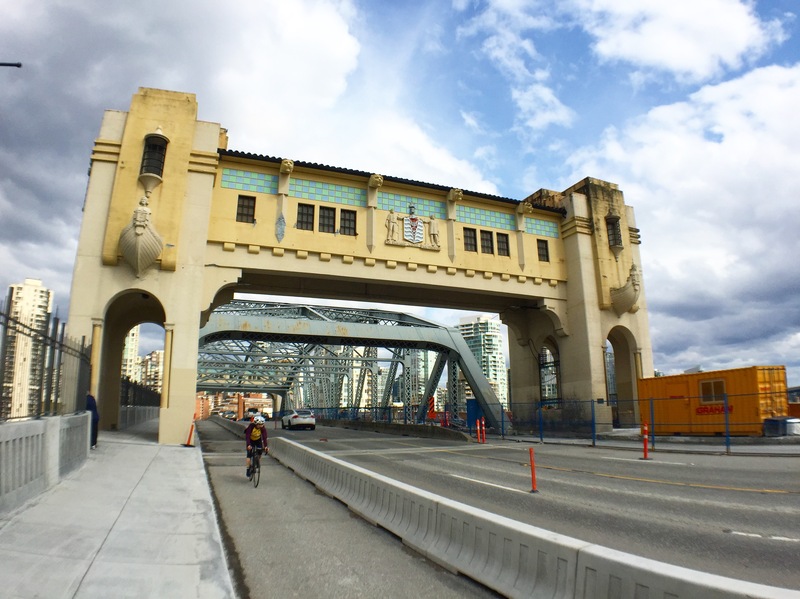 It was a struggle just getting to the Burrard Bridge. What perked me up a little more was seeing Cuski at the north end of the bridge. He even ran with me for a few blocks and we high-fived the rowdy November Project cheer section along Pacific. That was the boost I needed to tackle the last 12 km. When I ran by English Bay, I saw the run through wedding. It was so sweet. 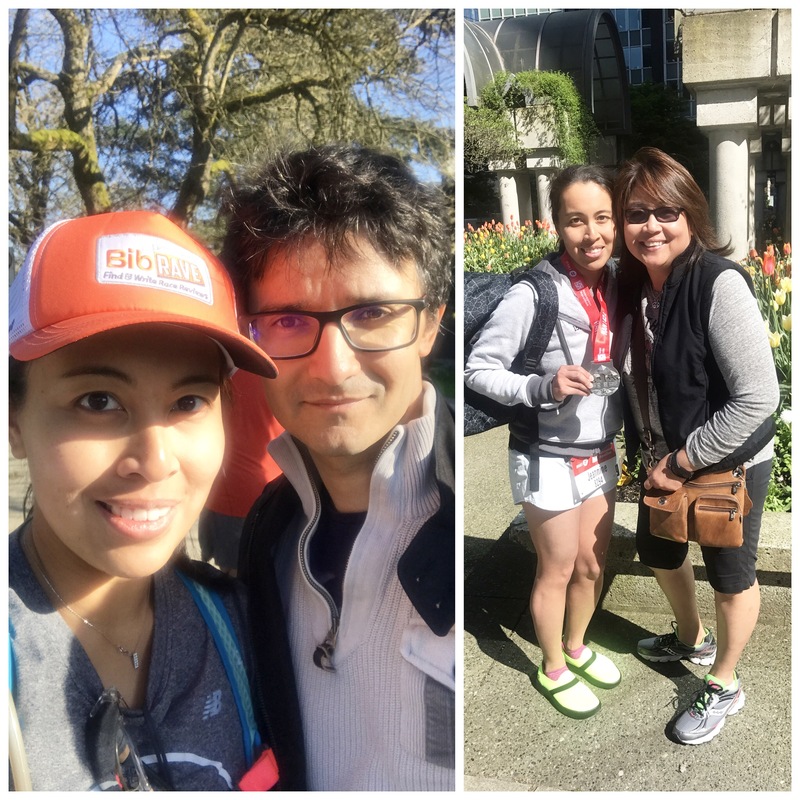 A First Nations couple decided to marry during the BMO Vancouver Marathon at the 32 km mark, which happened to be at the beach. They had rose petals, a decorated arch, wedding guests, and all. They even passed me along the seawall so I got to congratulate them. See their story on the CTV News clip below. When you’re cramping up, the seawall can be a long and lonely place. I was also slipping away from my 5-hour goal. Each kilometer took forever to arrive but I thought that the more I moved forward, the sooner I’d be done. I just focused on getting to each subsequent landmark. Once I was out of the park, I knew I had a mile to go. 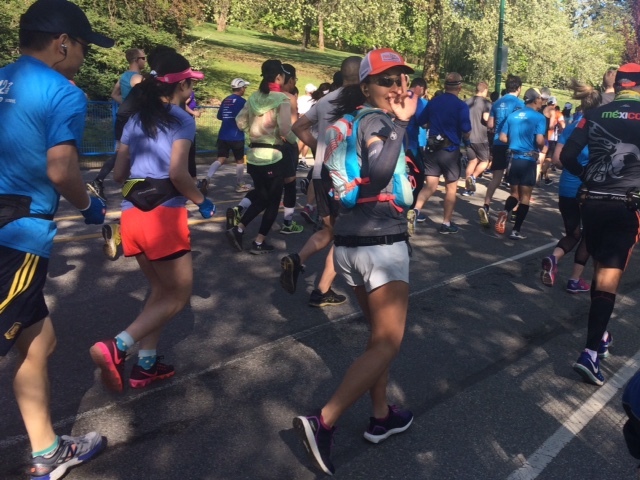 I was so happy to see Olivia and Garry at the 41 km mark cheering me on. Olivia even ran the last stretch with me, which was great because it forced me to push on that last hill. I am so grateful for her that day because she helped me stay close to a 5:30 time. Cuski and my mom cheered for me near the finish line, so I dug deep and sprinted. My chip time was 5:32:27, just over 20 minutes faster than Paris. I gave Olivia a hug, got my medal and photo taken, and proceeded down the runners chute to meet with my family. I love my family for supporting me. My sis even sent me a message from Seattle which I was so happy to read after. From when I finished, I thought I had failed. I came in a little too confident and was thinking a 5 hour marathon was within reach. Those dreams were crushed throughout the race. While I was ecstatic that I finished, I was still a little bummed. In hindsight, I actually did well and I’ve come to accept what happened. 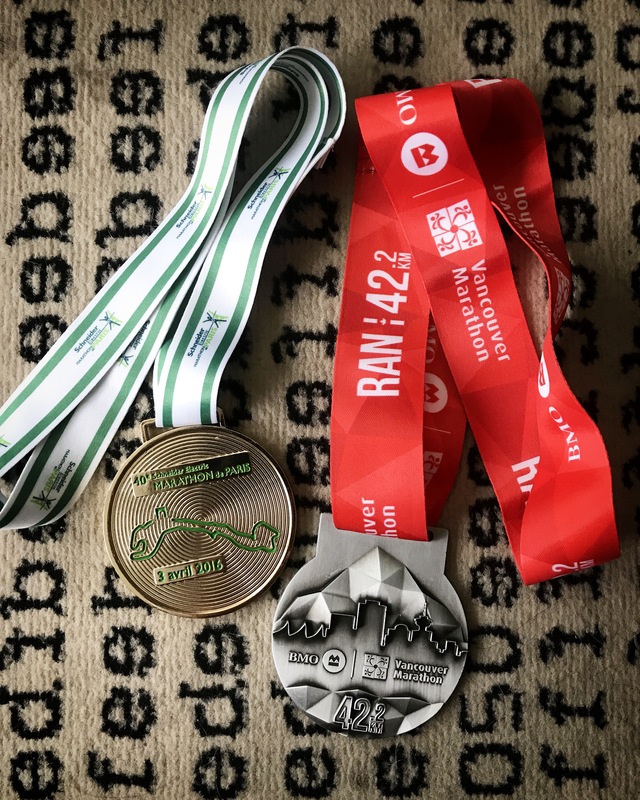 I PR’d by 20 minutes on a hillier course compared to Paris (my only other marathon). It was a solid effort, I just know there’s a lot of room for improvement. That’s my homework for Berlin. See those bright shoes I’m wearing in the photo above? Those are the brand new OOFOS OOmg recovery shoes and I made sure I had them at the finish line. As soon as I got them, I took my runners off and indulged my feet in all the arch-supportive goodness of OOfoam. They were light, cushiony, and they helped me walk (stiffly) to the train. I wore them the day after as well and even managed to go for a 3-5 km walk. 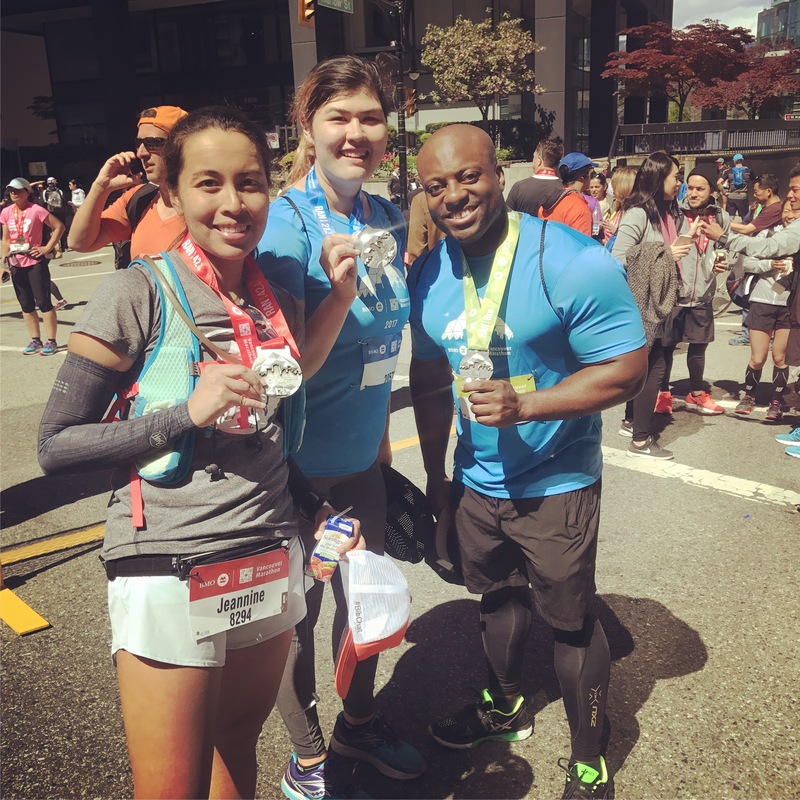 It felt great… my feet were happy, my leg muscles were another story. If you’d like your own pair, use code OOFOSBibPro10B at OOFOS.com for 10% off until June 15, 2017. 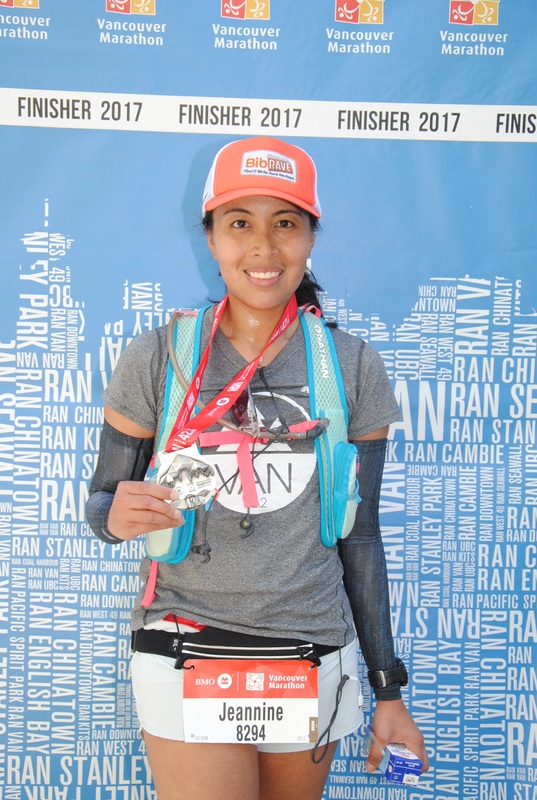 I had worn the BUFF® UV Arm Sleeves on previous runs but not on a warm marathon day. I’m happy to say they stayed put and even kept me cool during the race. It wicks sweat and when it evaporates, it creates a cooling sensation on my arms. Someone saw me wearing them the week before and thought it was just for fashion. I said, no, they’re fully functional and stylish at the same time. I’m just glad they passed the marathon test. Stay tuned for full individual reviews on both these products. As soon as you cross the finish line, you will be greeted by many smiling volunteers wanting to give you your medal, food, juice, chocolate milk and anything else. I hear there were massages and there’s even a recovery station with yoga mats and foam rollers. I had no strength for that. We made a bee-line to the closest restaurant so we could have lunch. The medal is beautiful. It’s my favourite so far. Yes I would! 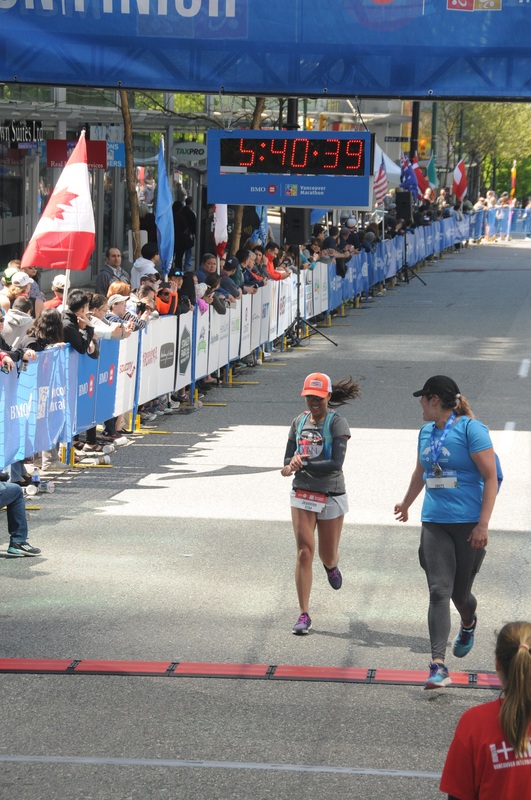 BMO Vancouver Marathon always throws fantastic races. From the expo to the finish line, it is well-organized and there’s so much hype and excitement. The swag is great, the courses are beautiful, and there’s usually lots of bands and people cheering on the course. I’ll most likely be back next year but the colour of my medal is yet to be determined. 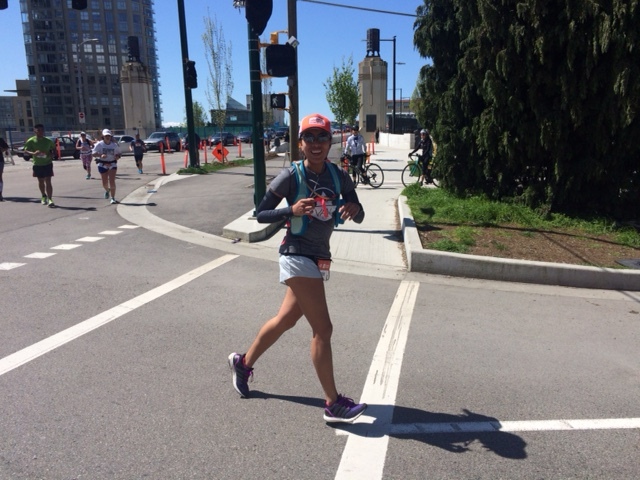 Thank you BMO Vancouver Marathon for another great race! If you feel inclined to do so, the next race will be on Sunday, May 6, 2018. 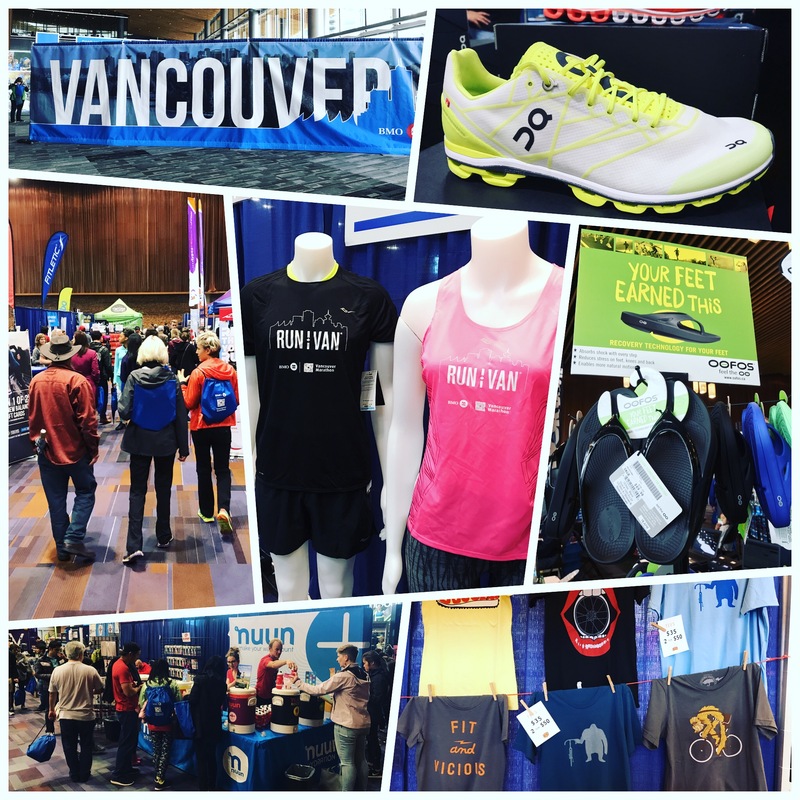 What did you think about the BMO Vancouver Marathon? 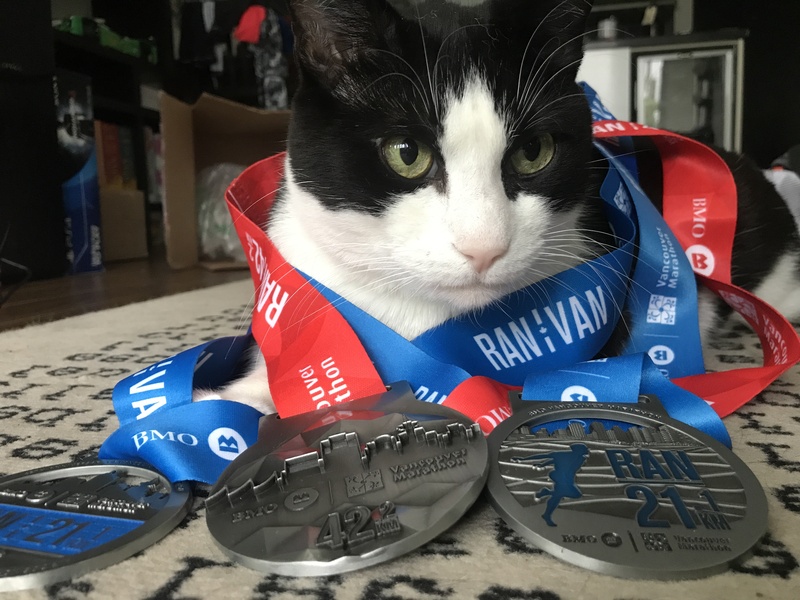 Leave a review on BibRave and share with other runners what you think! Awesome race review and I really love the photos! I volunteered at the start line this year – it was a total blast! Congrats to you!!! Thank you Jerod! Too bad we missed each other. Hope to see you at the next race!